Star Clippers have gained a reputation for providing unique tall-ship sailing experiences to a range of popular destinations such as the Eastern and Western Mediterranean, Caribbean, Cuba and the Panama Canal. In May, it was announced that Star Clippers would also be returning to Asia for the first time since 2010, offering itineraries in Thailand, Malaysia and Singapore from December 2016. This exciting news means that travellers will be able to enjoy a traditional sailing experience and visit a number of Asian gems along the way. These will include marine parks, beaches, uninhabited islands with diverse wildlife, beautiful reefs and scenic delights. We take a closer look at some of the highlights you can expect to visit on the northbound from Phuket itinerary. The Surin Islands form an archipelago in the Andaman Sea, 55km from the Thai mainland. This archipelago consists of five individual islands, each of which are forested and provide a home to a broad selection of wildlife. The Ko Surin National Marine Park encompasses the five islands and their surrounding waters. Here, you’ll discover beautiful beaches combined with one of the most famous dive sites in the world, Richelieu Rock. Should you decide to go snorkelling, you’ll be greeted by some of the most beautiful and pristine reefs in the area. A group of nine islands within the Andaman Sea form the Similan Islands, which are renowned for providing diving enthusiasts with fantastic underwater sightseeing opportunities. 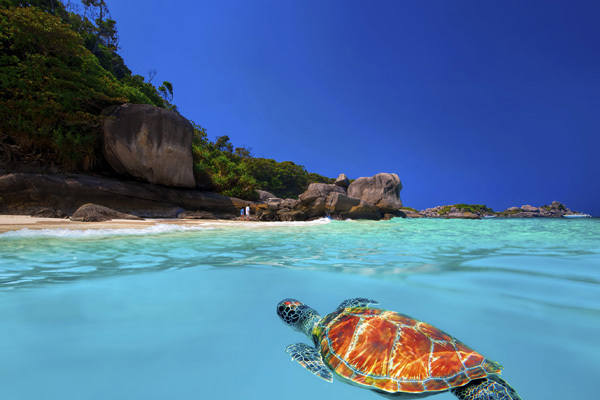 The crystal clear waters and diverse wildlife make the Similan Islands, which are only accessible by sea, a perfect destination for tranquil relaxation. You might not think much of Hin Daeng when you arrive for your early morning visit, as the chances are the only thing you’ll see is three rocks at the surface. However, this location offers much more than meets the eye. Still not convinced? Plunge into the waters before diving to a depth of over 50 metres and you’ll change your mind. This is one of Thailand’s most dramatic diving sites and there’s a good chance you’ll witness white sharks and manta rays. 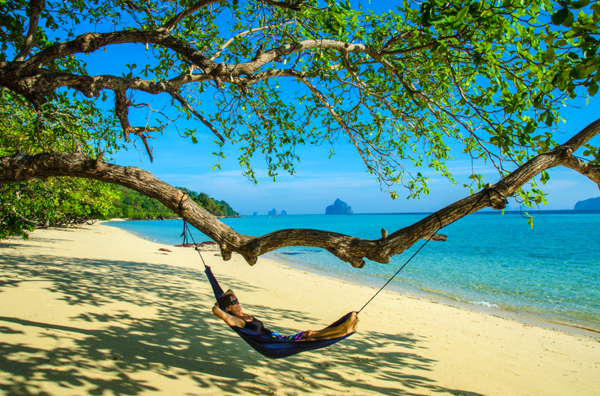 If you love relaxing on the beach then you’ll enjoy a quiet day in Ko Kradan; a practically uninhabited island that can offer a sense of the Caribbean. Excellent swimming opportunities, powder-like sand, a sea breeze and gentle waves make this a beautiful spot to soak up the sun. There are no roads, villages, shops or police stations on the island of Ko Kradan. Just a small station, which overlooks the Hat Chao Mai National Park which covers 90% of the entire island. 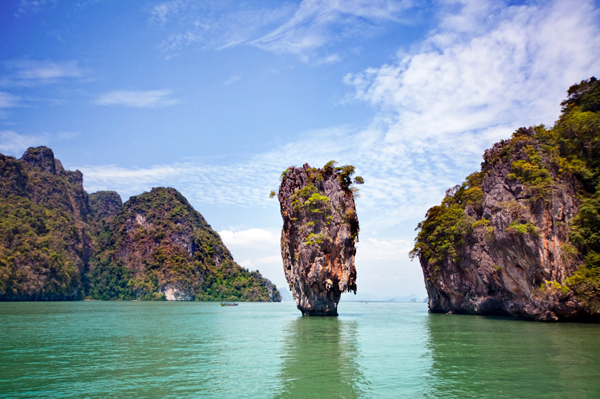 Some of the most spectacular scenery in the whole of Thailand will be found at the Phang Nga Bay. Here, you can expect to find sheer-sided mountains that rise out of the bay, as well as forested limestone towers, caves and hidden coves. 10,000 years ago, when the sea levels were lower, it was possible to walk from Phang Nga Bay to Phuket – but then it would also be inaccessible on this Star Clippers cruise itinerary. This shallow bay consists of 42 islands and provides a home for a wide variety of wildlife from bird species to reptiles and even a handful of endangered species such as the serow and the finless porpoise. The new Star Clippers Asia itineraries will allow you to enjoy everything you love about tall-ship sailing, combined with opportunities to witness exotic wildlife and relax on golden beaches. If you love cruising but want to embark on a more traditional sailing experience, you’ll love Star Clippers.